A couple of weeks back, Robert Szajkovics was at wits end, averaging more than 10 pins below last season�s 224 in his Sunday morning men�s league at Orland Bowl. It might have been a nice time to buy himself a Christmas present. Instead, he had a hunch. He took the ball, an 8-year-old Track Equation, to teammate Fred Rozak. Rozak, who is a part-owner of Bowler�s Alley Pro Shop at Orland Bowl, redrilled it. What happened after that is a tale that Szajkovics will tell over many a holiday season. 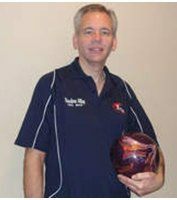 The 55-year-old Homer Glen resident had a career day Dec. 28, shooting games of 254, 300 and 299 for an 853 series. The perfect game was his 15th, the series smashing his previous high of 794. �It was like an out-of-body experience,� Szajkovics said. I was like, �What is going on? Who is this guy?� Before that I�d had one legitimate shot at an 800 in the 40 years I�ve bowled. It started inauspiciously, shortly after Szajkovics arrived at the lanes early to pick up the ball. �I threw a few practice shots and I was sticking on the thumb,� he said. �So Fred ran back into the pro shop and opened up the thumb hole. Szajkovics went on to 40 pins over average in the first game, then embarked on a prolific string of 23 strikes that didn�t end until his final shot � a ball that was buried in the pocket and left a 9-pin. He finished with 31 strikes in 36 chances. Szajkovics began bowling at age 15. He didn�t make the cut when he tried out for the team at St. Laurence. �I wasn�t good enough back then,� he said. �I was just learning the game. My parents were bowlers and they used to drag me to the bowling center as a kid. I grew up around it so I got interested in it. Szajkovics tossed his first perfect game in 1989. He has also made the 300 honor roll at Clearing, Lisle Lanes, Fox Bowl, Pioneer Lanes, and Joliet Town and Country Lanes. Szajkovics is a bowling survivor, especially in the recent past. Five years ago he underwent back surgery, and nearly two years ago he had right arm and shoulder surgery. He has been bowling with a torn meniscus in his left knee and will have surgery in February. History says the comeback should be interesting.